In keeping with my training I’m going to post all my meals so that hopefully I won’t cheat, and also so those of you who are also training for a half marathon can see what works and what doesn’t! 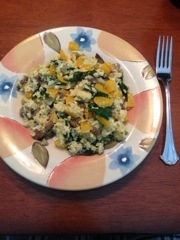 For breakfast I had a vegetable egg scramble with bell peppers and mushrooms. It was super flavorful with not a lot of calories and kept me full until lunchtime which is always a big plus. I met a friend for lunch at Mellow Mushroom…so tempting, but I built my own salad with spinach for a base, pesto chicken for my protein, roasted red peppers, and balsamic vinaigrette. It was delicious and only clocked in at 360 calories! 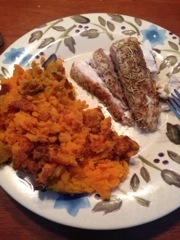 For dinner I had grilled red snapper that I picked up from the farmers market yesterday and a sweet potato.